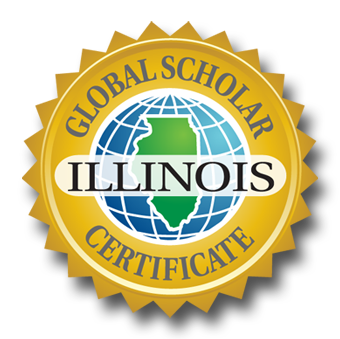 A primary function of the Global Scholar Committee (GSC) is to evaluate existing programs and curricula to ensure that students are able to meet requirements for the Illinois Global Scholar Certificate. This means that members of the GCS must conduct an audit of current courses and opportunities available to students and, if necessary, adjust or add new courses or opportunities. 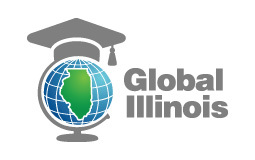 The Global Scholar Committee must also determine the best pathway for students to complete the Illinois Global Scholar Performance-based Assessment. Below are the four requirements students must complete to receive the Illinois Global Scholar Certificate along with parameters established by the Illinois State Board of Education. Provide opportunities to take action to improve conditions in a manner consistent with the learning standards adopted by the State of Illinois. The course must address world issues, perspectives, concerns, or culture throughout the duration of the course in sufficient depth and breadth. Breadth. Courses that employ a global focus or address global topics in some units but not others are not sufficient to be deemed globally-focused courses, nor are courses that survey global arts, foods, or music without at least ⅓ of class time being devoted to the investigation/research into global phenomena, and/or assessment of the global and cultural context from which the phenomena arise. Depth.Though high schools offer some or many of the courses listed above as “likely to be globally-focused”, the courses and subject areas listed above are not the only courses that may qualify as globally-focused. Other courses, such as those in family consumer science, the arts, mathematics, health, and agricultural science, may also qualify, provided that an appropriate depth of knowledge of, and inquiry about, global issues and diversity is incorporated. The examples identified in the following chart, though not exhaustive, are provided to give guidance to school districts and GSCs seeking to determine if a course investigates the world. Music, Drama, or Visual Arts Students create an artistic piece or performance inspired by another culture. Students interpret, create, and/or evaluate a global issue through an artistic medium. Foods or Culinary Arts Students prepare food from another part of the world or another culture. Students prepare food from another part of the world or another culture and consider the production and preparation of food in relation to local cultures, health, sustainability, etc. Mathematics Students use datasets from another country or culture to illustrate a concept. Students evaluate and use appropriate mathematical tools to investigate a global issue OR derive additional information using mathematical methodologies. Agricultural Science Students use examples of agricultural management, finance, marketing, and/or the foundations of crop and livestock production in a unit on the global marketplace. Students learn about agricultural management, finance, marketing, and the foundations of crop and livestock by comparing a variety of agricultural practices found around the world and examine the complex global interrelationships that exist among the global agricultural industry. Health Students learn about epidemics/disease, health care practices, and/or prevention measures through cases studies in other parts of the world. Students learn about global epidemics/disease, health care practices, and prevention measures through a comparative epidemiologic analysis incorporating diverse global contexts. Contact info@global-illinois.org if you would like to receive a worksheet to help the Global Scholar Committee determine courses with a global focus. The activity or experience must be tied to tied to globally-focused coursework, co-curricular activities oriented toward global service, and/or the student’s Global Scholar Performance-based Assessment. incorporate multiple reflection activities that challenge students to think deeply about the relationship of self, society, and the world. Students participate in the globally-focused service learning experience or activity for a minimum of one semester. Service learning activities and experiences must align with State and district learning standards, as well as curricular goals and objectives of the school district. Contact info@global-illinois.org if you would like to receive a worksheet to help the Global Scholar Committee determine qualifying globally-focused service learning opportunities. Students must dialogue or collaborate with global peers whose culture is markedly different than their own. to assume shared responsibility for collaborative work and value the individual contributions made by each team member. Creating and maintaining a list of recommended global collaboration and dialogue opportunities approved by the district. A list of global collaboration opportunities can be found here.